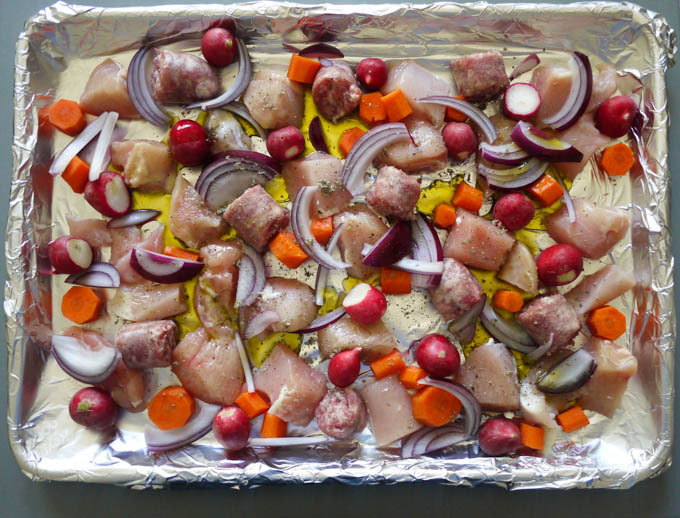 Short of flinging things into a slow cooker, is there anything easier than making a tray bake? Here in the U.S., I think we just call them “bakes”, but I’m sticking with “tray bake” because I like the sound of it. I first discovered a version of this watching Nigella Lawson. 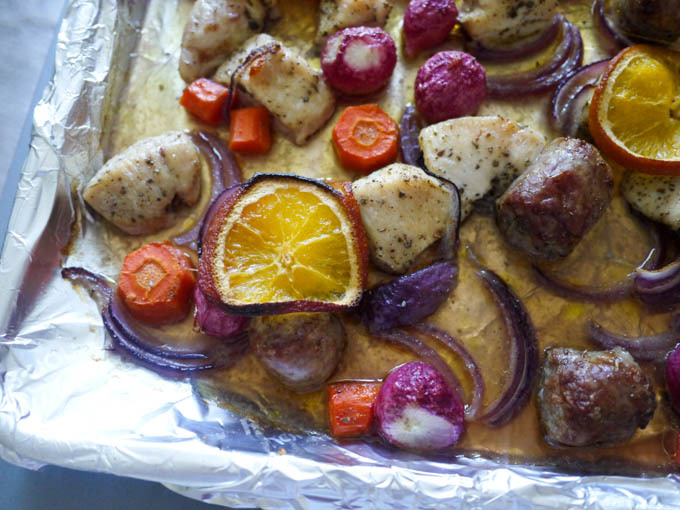 She threw some seafood on a tray and doused it in rose wine before roasting it all in the oven. I will never forget the episode because she appeared to eat a shrimp whole, shell and all, from the top of pile when it was done. My husband and I just looked at each other in horror. Is this a thing, eating shrimp shells?? Well, this version combines all those fresh summer grilling flavors, all done in the convenience of an oven. It’s heaven on a clear winter’s day. You know the kind of day that looks like summer until you open the door and feel the biting cold? Yeah, that kind. 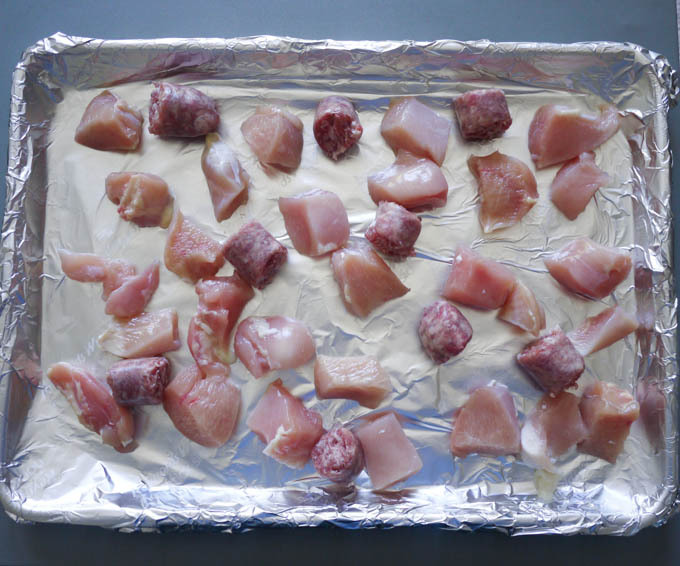 Cube the chicken breasts and bratwurst and toss them onto a baking sheet. NOTE: If you are using foil to line your baking sheet like I am above, make sure the foil is in one piece and that it covers the entire width and length of your baking sheet. We are going to add liquid to this later and if there are any holes or tears or parts where the foil doesn’t extend over the edges, the liquid is going to pool between the bottom of the foil and the baking sheet instead of bathing our meat and vegetables. 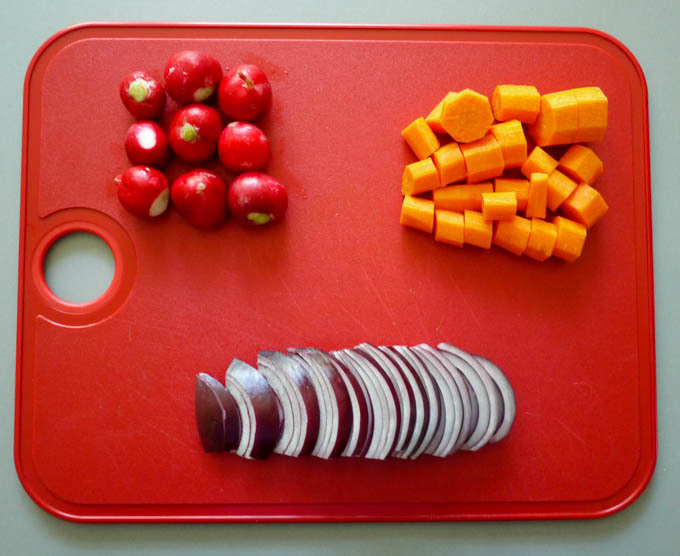 Peel and chop the carrots, slice the onion and give the radishes a quick rinse off. It is not necessary to cut the ends off the radishes. Toss your vegetables onto the sheet with the meat. Sprinkle with olive oil, dried sage, salt and pepper and toss with your hands to make sure everything is coated with oil and spices. Top with thin slices of juicy orange. 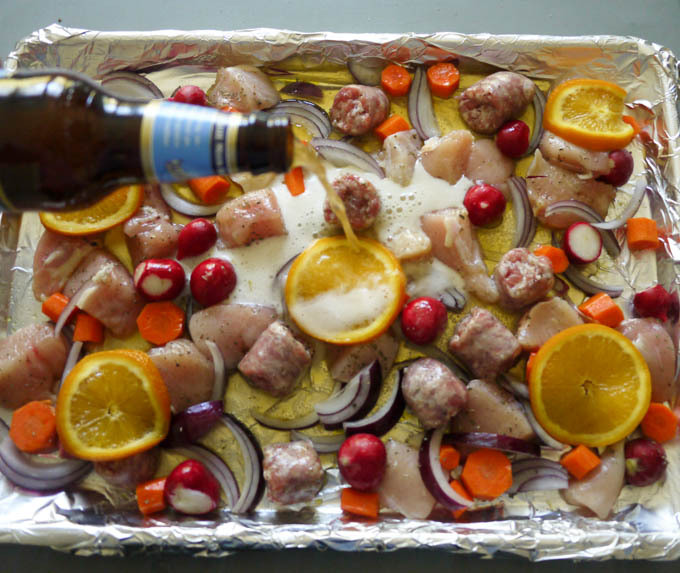 Pour beer into the meat and vegetable mix. 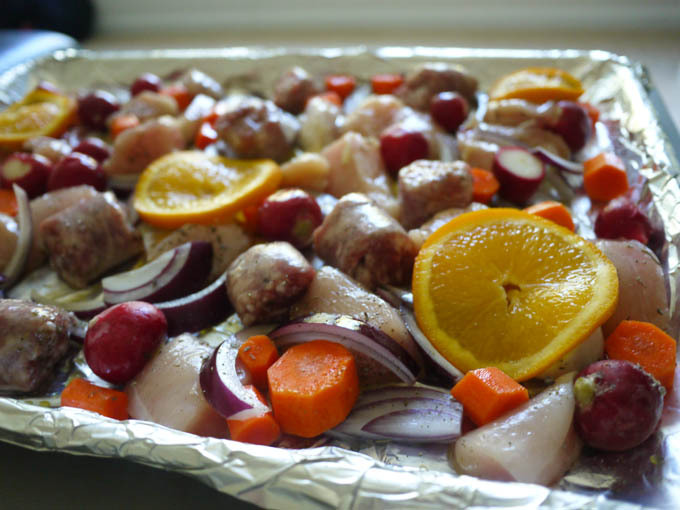 Roast for approximately 40 minutes, until meat is cooked through and vegetables are fork tender. 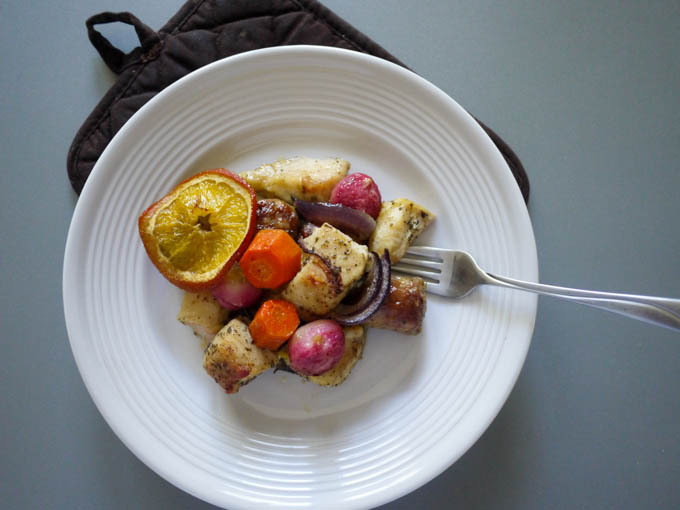 Serve with a slice of roasted orange for garnish. 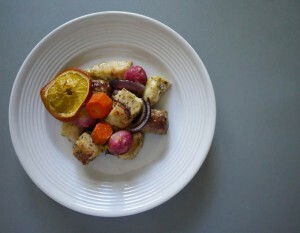 Chunks of chicken breast and bratwurst roasted in Belgian white beer with onions, radishes, carrots and seasoning. Top with thin slices of orange. Potatoes would be an awesome addition!! This looks delicious! Is there a way to swap out the blue moon beer? I don’t drink alcohol anymore, but I would really like to give this recipe a try.